The reset of reactive systems in testing can be impossible or very costly, which could force testers to avoid it. In this context, testers often want to generate a checking sequence, i.e., a unique sequence of inputs satisfying a chosen test criterion. 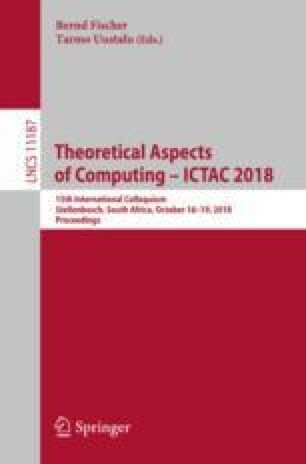 This paper proposes a method for generating a checking sequence with complete fault coverage for a given fault model of reactive systems. The systems are represented with an extension of Finite State Machines (FSMs) with symbolic inputs and outputs which are predicates on input and output variables having possibly infinite domains. In our setting, a checking sequence is made up of symbolic inputs and the fault domain can represent complex faults. The method consists in building and solving Boolean expressions to iteratively refine and extend a sequence of symbolic inputs. We evaluate the efficiency of the approach with a prototype tool we have developed. This work is supported in part by GM, NSERC of Canada and MESI (Ministère de l’Économie, Science et Innovation) of Gouvernement du Québec.